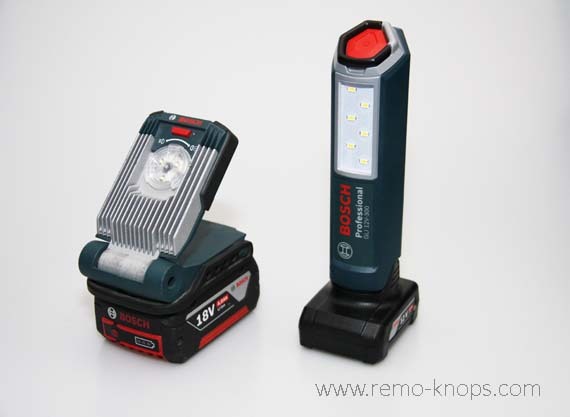 Bosch Blauw GLI 12V-300 LED Professional Light is the newest member of my Bosch Professional 12V family. Since there is no good review available online with some good quality pictures I’ve decided to purchase the light and craft a review myself. In this article I will cover the GLI 12V-300 LED design and compare it with the GLI VariLED and GLI PocketLED. 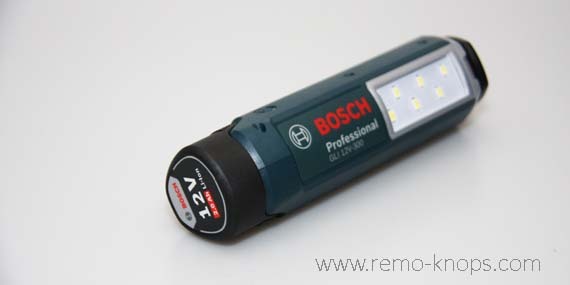 Bosch Professional GLI 12V-300 LED is the successor of the Bosch Professional GLI PocketLED 10,8V. 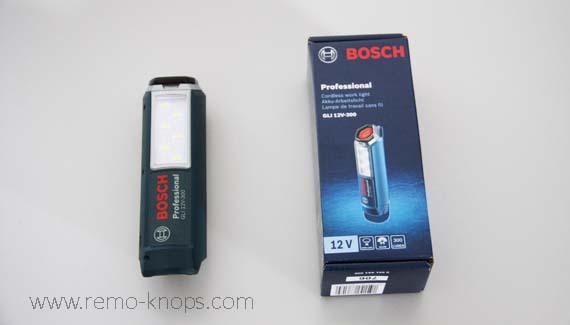 The PocketLED was more or less a traditional flashlight powered by a Bosch battery. The new GLI 12V-300 LED deviates from that design, simply because there is no single light in the flashlight head. The 6 LED lights are placed on the long side of the light, and produce 300 lumen. A large on/off switch in the typical Bosch-button-red is situated on the top of the Bosch Professional GLI 12V-300 LED. Furthermore you will see a cleverly integrated hook, so you can hang this LED light on your construction site. The hook is foldable and crafted from strong plastic. However I wouldn’t risk a drop with the hook unfolded. The dimensions of the Bosch Professional GLI 12V-300 LED are 55 mm. x 51 mm. x 182 mm (L x B x H). The light has hexagonic shape, so it cannot roll-over and it gives you a solid grip. However with a diameter of 5.5 cm it is not super slim. If you use the 4,0 Ah battery with the Bosch Professional GLI 12V-300 LED, than the battery gives a strong and firm foot to the light. However the hexagonic shape still makes it easy to grab. If you put the GLI 12V-300 LED in an upright position with the round 2,5 Ah (or less) battery it feels a little wobbly. Therefore I would just use the GLI 12V-300 LED on its side with these smaller batteries. A couple of years ago I got the Bosch Professional GLI VariLED as gift. Initially I thought I would rarely use it, but it became one of the most used tools in the 18V Bosch-family. 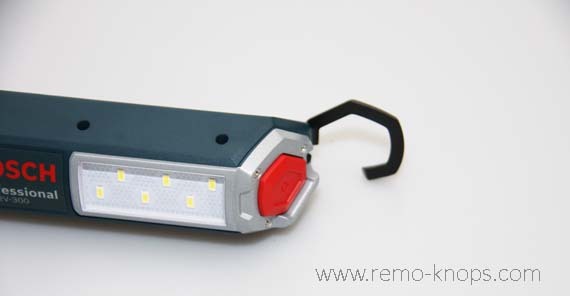 It is a very slim light with angular adjust-able mechanism that stands firmly on the 18V battery. However the GLI VariLED has its standard spot in the L-Boxx of my Bosch GSR 18- cordless drill. 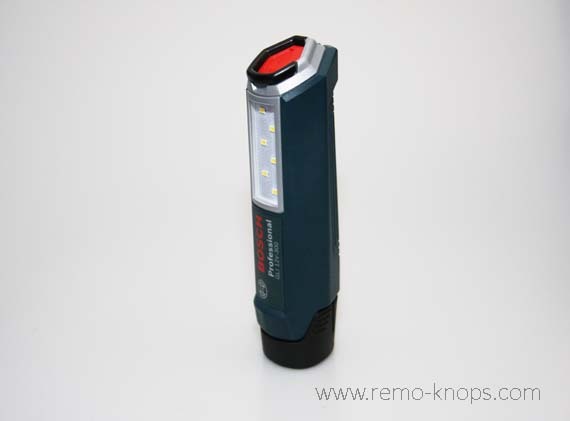 The GLI PocketLED 10,8V is very traditional flashlight when you look at the design. I did have a Bosch Green version of this light as well, but wasn’t a huge fan of the single light in the flashlight head. Bosch Professional GLI 12V-300 LED Light has claimed it’s spot in the L-Boxx of the Bosch Professional GSR 12V-15 FC (FlexiClick) cordless drill. The price-point of the Bosch Professional GLI 12V-300 LED Light is EUR 35,– which is very reasonable for a solo machine without L-Boxx, batteries or charger. Interested in reviews of other quality hand tools than check out the tools category of the cycling review table. Jeff Kirk from ToolboxBuzz has another interesting point I fully agree with. The hook of the light should be rotateable around the lights’ vertical (long-side) axle. That would provide even more flexibility, but a more complicated design and higher price-point.